The Chevrolet Cruze is based on a chassis design that has a high level of torsional rigidity that is fundamental to achieving excellent running refinement, suppressing noise vibration and harshness (NVH) as well as optimised handling and stability. The Cruze is a product of a co-operative engineering project at General Motors facilities in Korea, the United States, Australia and Germany. For key elements of the vehicle the design team drew on the vast store of technical knowledge within the global General Motors organisation and applied ‘best practices’ applied within the organisation on a global scale. 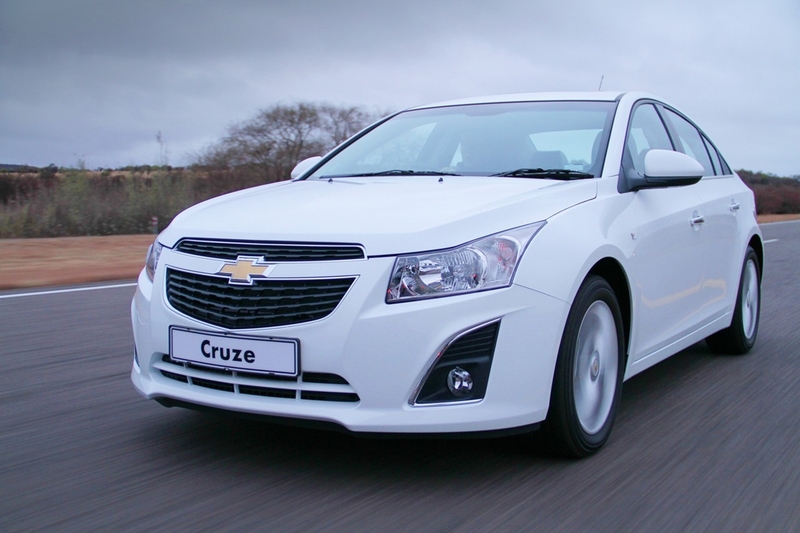 The stiff body structure gives the Cruze a solid upmarket ‘hewn from solid’ feel. On the road the inherently taut body structure makes a major contribution to eliminating annoying squeaks, rattles, vibrations and resonances. The core structure is a unitary construction fabricated from steel beams, pressings, and box sections. The overall torsional rigidity of 17,66 KNm/degree of deflection is among the best in the class in which the Cruze competes. To put this in perspective, the body structure is as strong as a metre long rod, that, fixed at one end would bend no more than one degree under the weight of a fully laden large car (or a small elephant for that matter) placed on the other end! In the order of 65% of the Cruze body structure is composed of high-strength steels. Most of this is used in critical areas, such as the front and rear elements, longitudinal rails, and side sills to increase overall strength and stiffness. More important however is how the structural elements of the body connect and interact in sharing the load-bearing task. Aside from the high strength steels, a high number of spot welds is used as well. Tailored-blanks, that concentrate extra strength and weight only where required, are used extensively. The result is long term durability and rigidity. Reinforcing members run either side of the central tunnel along the entire length of the floor pan. This sub-structure includes box sections formed from high strength steel and create a strong longitudinal backbone down the centre of the vehicle. The side structure features two large, single-piece, body pressings that include the door openings. The inner and outer stampings are precision welded together with a tolerance of no more than 2mm along the length of the vehicle. Apart from adding rigidity to the body structure, these side pressings enable the exterior body panels to be fitted more accurately for the quality finish and panel fit that characterises the Cruze. The stiff structure that is at the core of the Cruze makes it an easier task for the engineering team to isolate residual powertrain, road, and wind noise for a quiet and refined ride. As a result the interior acoustic quality and wind noise ratings for the Cruze are amongst the best in class for compact sedans in the value segment. A number of additional refinements also contribute to the refined ride experienced in the Cruze. The engine and transmission are mounted on a sub-frame that is isolated from the main body structure by four rubber mountings. This helps minimise the amount of road noise and vibration that is transferred into the cabin of the vehicle and also facilitates tuning of the ride and handling characteristics. The lower engine compartment side rails that carry the sub-frame extend into the two main longitudinal members along the floor of the vehicle. This helps to further dissipate powertrain noise and vibration, while also reducing vibrations that occupants might typically feel in their feet resting on the floor of the vehicle. The front bulkhead is sandwiched between two large sound deadening mats. On the cabin side, a 25mm thick rubber mat is tightly fastened to the metal. On the engine compartment side, pre-formed fibreglass insulation 10mm thick is used. All openings for wiring and cables are as small as possible and are closed off with composite grommets. A pre-formed fibreglass pad is fixed to the underside of the bonnet to further deaden noise. Pliable rubber seals along the sides of the bonnet, and at the rear edge of the bonnet and air induction panel ensure a snug fit for the bonnet and further inhibit the transfer of noise. Composite nylon baffles are placed at key points within the hollow sections of the body structure to reduce the transfer or airborne noise. These result in a noise reduction of 40 decibels throughout the entire body structure. Each baffle is moulded to fit its specific location. Sections are effectively sealed off by the use of foam adhesive that expands when the body passes through the paint ovens during manufacture. Refinements in the door area include a fibreglass blanket inside the door that serves as a water, airflow and noise barrier. All doors incorporate triple-layered sealing, including the lower edges of the doors and trailing edge of the rear doors. Secondary seals are also door mounted rather than fixed to the body, ensuring an enhanced appearance around the door openings and pillars. All apertures within the doors are closed off with composite grommets to reduce the transfer of noise, vibration and airflow into the passenger compartment. The headliner is of a thermal fibre composition, not usually found in this sector of the market. It incorporates a three-layer polyethylene/felt section for superior sound isolation and a two-layer polyurethane outer skin for an upmarket woven fabric appearance. These are strategically applied to interfaces between small body sections that can resonate or vibrate over time. The patch material – similar to tar in look and viscosity – permeates the smallest crevices in the body structure. The melt on patches are applied in the body shop and melt on in place when the body passes through the paint ovens. Compared to conventional patches, applied with adhesive, the melt-on process ensures perfect conformity. The result is a significant improvement in damping performance compared to materials applied using adhesive mounted products. The interior carpeting – precisely formed to the shape of the floor pan for a precise fit – incorporates a composite underlay and thick, 14 ounce carpeting material. The precise fit of the carpet eliminates any gaps between the surface of the floor pan and the carpet to effectively damp out noise and vibration coming through the floor of the vehicle. A number of measures have been employed at the rear of the vehicle, primarily in the boot area, to reduce the transfer of noise into the vehicle. These include: full lining of the boot area with a thick walled (10-20mm) acoustic material; liberal use of ‘cotton shoddy’ (made from recycled denim jeans!) between the boot lining and the rear body structural components; a deck lid liner made from compressed fibreglass inset into the underside; and an acoustic mat on the boot floor. The body is extensively sealed with a variety of sealants – including pumped sealant applied as foam, squirt-on sealers, and welded sealers – to eliminate the smallest of gaps. The widespread attention to the sealing of joints is another major contributor to the excellent acoustic quality of the Cruze. Composite liners are placed inside all four wheel arches to help damp noise when driving on wet roads or loose surfaces, such as gravel roads. Building on the solid foundation of the Cruze to ensure a quiet and comfortable ride, the design team has also added refinement through the application of latest automotive technologies. Within the body structure, a high speed and low speed CANBUS (Controller Area Network) connects control modules and ensures that information is communicated and shared to continually optimise the vehicle’s function and performance. These electronic data buses are the nerve system that operates the vehicle while the various sensors that they connect can be considered as the nerve endings of the architecture. The high-speed data bus has the capability of communicating virtually instantaneously. It handles critical control areas, linking modules responsible for the anti-lock braking (ABS), engine and transmission control and traction control. The low-speed data bus handles the remaining modules responsible for instrument panel controls, entertainment and information applications, comfort and convenience features, occupant protection functions and personalised settings. The IBCM is essentially the heart of the electrical system and acts as a gateway between the high-speed and low-speed data buses. The IBCM performs multiple functions, including converting signals from high-speed to low-speed and relaying information and requests between the two data buses. The IBCM also controls many functions operating on the low-speed bus, frequently interfacing with other modules on the system. Some of these functions include: exterior lighting control; window wiper/washer control; battery run-down protection; driver information display; vehicle theft protection; interior lighting, and door locking and unlocking. Fitted to the Cruze 2.0D LT, this feature will automatically start the windscreen wipers when rain is detected on the windscreen. It operates at one of five sensitivity settings as selected by the driver. The system uses a glass-mounted infrared sensor positioned discreetly behind the rear view mirror. This sensor continually transmits infrared beams against the windscreen to detect the presence of rain, snow or sleet. Once moisture is detected the system automatically adjusts the wiper speed according to the intensity of the rain. Also fitted as standard equipment on the Cruze 2.0D LT, the Rear Ultrasonic Park Assist system uses four sensors located on the rear bumper surface to send out ultrasonic waves and pick up the echo signal when these bounce back off an object when reversing the vehicle at low speed. Triangulation is used to determine the relative distance, based on the elapsed time between the outgoing signal and its return. LED read-outs inform the driver of the proximity of an object at the rear of the vehicle. Another feature of the Cruze 2.0D LT, the automatic headlamp system allows the headlights to be set to switch on automatically in low light and off again in daylight. The lights can also be set to stay on for up to three minutes after leaving the parked vehicle. Fitted as standard across the range, the transponder ignition key system transmits a coded signal from the key to a receiver placed near the ignition switch. If this coded signal is not verified the vehicle’s Body Control Module (BCM) will not allow the engine to start. Also standard across the range is an anti-theft alarm system that utilises sensors to detect breakage of the vehicle glass or any attempt to open the doors, boot, or bonnet when the system is set. An audible alarm sounds when any intrusion is detected.